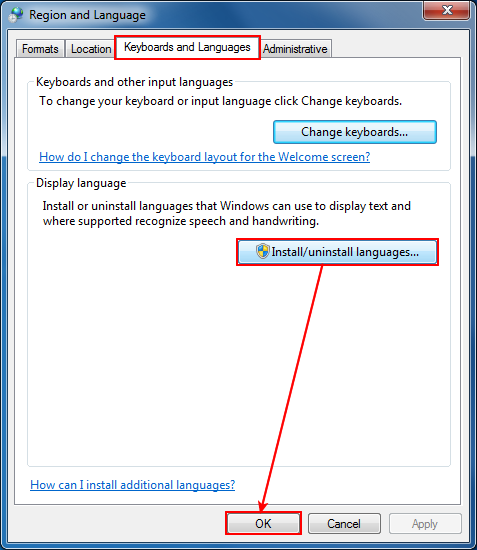 Windows 7 (or previous versions) by default does not install some supplemental language files when the main language used for the setup is English. Because of this, some equations/formulas might not show in the PDF file, even if they are displayed in the original document the conversion was started from. So the fact that these equations are not shown in the PDF is more an operating system issue rather than a novaPDF bug. Click the Install/Uninstall languages button to install the language files you need. Press OK. You might be asked for your Windows installation CD, so make sure you have that handy. After the language files are installed, you will have to restart the computer. After being installed, you will be able to print the equations (formulas) to PDF using novaPDF. Windows 7 (or previous versions) by default does not install some supplemental language files when the main language used for the setup is English. Because of this, if you want to convert a document that contains characters from East Asian languages (such as Chinese, Japanese, Korean or Vietnamese), some of these characters might not be correctly converted. The fact that these characters might not be converted is in fact an operating system issue rather than a novaPDF bug. This tutorial shows how to use novaPDF to convert an XPS file to a PDF document. novaPDF is a PDF converter that allows creating PDF files from any windows application that supports printing. If you do not have novaPDF installed, use the Download page to download and install it. The following article explains how to convert a nb file type to a PDF document by using the novaPDF driver along with the Wolfram Research Mathematica application. To be able to make the conversion, download the novaPDF converter from the Download page. What settings are needed to disable Save As dialog?